Southern Florida and the Keys are an exotic mix of lush tropical vegetation and bracing salt air. The justly world-famous Everglades teems with wildlife. Traveling south through the Keys, surrounded by the turquoise waters of the Gulf of Mexico, one experiences a feeling of freedom, as if the weight of the great North American land mass has dropped from one’s shoulders. An amazing number of butterflies that call this area home can be found nowhere else in the United States – Schaus’ Swallowtail, Bahamian Swallowtail, Atala, Fulvous Hairstreak, Amethyst Hairstreak, Miami Blue, Cuban Crescent, Florida Leafwing, Mangrove Skipper, Three-spotted Skipper and Monk Skipper! This trip offers the rare opportunity to see a number of these species in areas not accessible to the general public. Other choice species, such as Dina Yellow, Malachite, Florida Purplewing, Dingy Purplewing, Ruddy Daggerwing and Hammock Skipper, are most easily found here. In addition, there is always the possibility of a stray butterfly from Cuba or the Bahamas – species such as Disguised Scrub-Hairstreak, Cuban Peacock or Pale Cracker. We retain the right to remain flexible as to our exact itinerary in order to take best advantage of hot spots and to enable us to work with the weather, not against it. Exactly where and when butterfly populations will appear is highly dependent upon local environmental and climatic conditions. The uncertainty heightens our excitement. Day 1. Friday. The tour begins this evening in Miami, Florida, at the airport. Night in a comfortable hotel in Florida City. Day 2. Saturday. Today we will visit a number of areas north of Miami. If we are lucky, we will see our first Atalas here. These spectacular tropical hairstreak have abdomens of day-glow orange and black wings decorated with brilliant iridescent turquoise spotbands. Near the brink of extinction in the 1980s, Atalas have flown back to life! In the past, in addition to Atalas we have seen Malachites, Ruddy Daggerwings and Three-spotted Skippers at choice locations that we have found. Another possibility is a spectacular species, not yet on the U.S. list, that is now resident in the area. Night in Florida City. Day 3. Sunday. Everglades National Park, set amidst a vast sea of grass with inclusions of hammocks and pine rocklands, is one of the crown jewels of the National Park System, and is home to a number of very rare butterflies and other fabulous wildlife. A visit to Royal Palm Hammock is a must for any naturalist. Walking on the boardwalk into the Everglades, we will not ignore the alligators, soft-shelled turtles, anhingas, and throngs of herons and other water birds, but we will also search the pickerelweed, that emerges in scattered clusters from the water, for skippers such as the large Palatka Skipper. We may find Ceraunus Blues, beautiful White Peacocks and Southern Broken-Dashes. 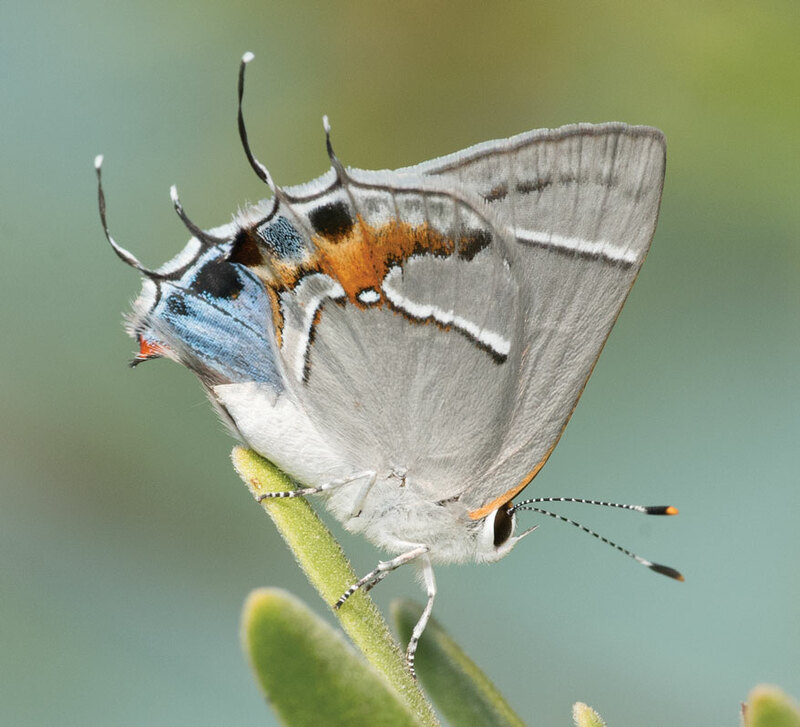 At Long Pine Key, in pine rockland habitat, we will search for Florida Leafwings, a south Florida endemic and Bartram’s Scrub-Hairstreaks, one of the snappiest hairstreaks in North America. Both of these species are very rare and both feed on the local crotons. 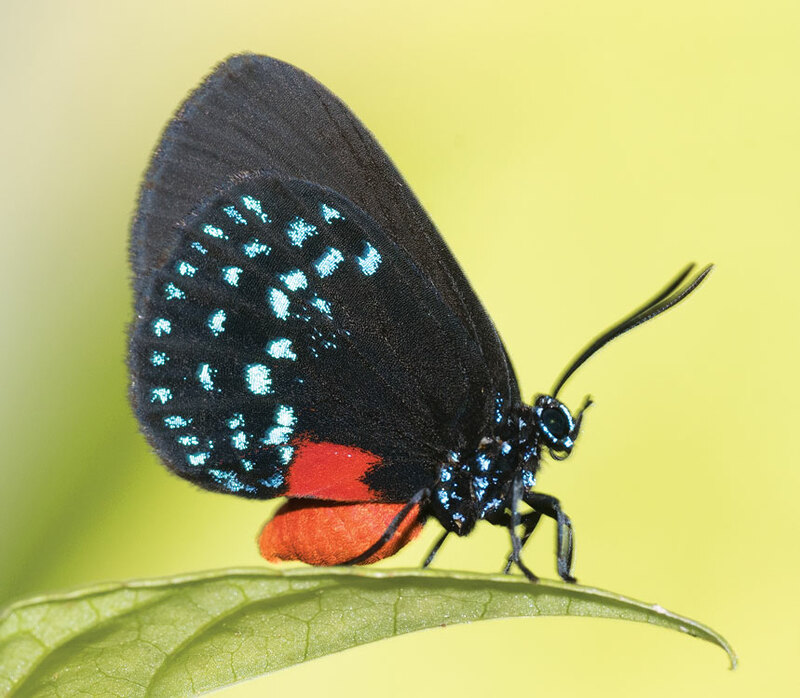 Also sometimes here are Little Metalmarks, one of the most scintillating butterflies in the eastern United States. Farther south along the road to Flamingo, we may find Obscure Skippers, while Eastern Pygmy-Blues may be tremulously flying over glasswort mudflats near Flamingo itself. As a bonus, the view from Flamingo looking into the Gulf of Mexico is spectacular! Night in Florida City. Day 4. Monday. We are trying to arrange for a charter boat to visit Elliott Key, the best place in the U.S. to see Schaus' Swallowtails and Bahamian Swallowtails. However, this depends upon Biscayne National Park changing its policy about charter boats, a policy that is now being reviewed. If we are unable to visit Elliott Key, then we will drive south to northern Key Largo, at the northern edge of the Florida Keys, where we hope to see federally endangered Schaus’ Swallowtails nectaring at flowers at a special site we have located. This is truly a special opportunity! One year, a mating pair of Mangrove Cuckoos was at the same spot. Of course, other wonderful butterflies will also be present. We should see Great Southern Whites, Little Yellows and Gulf Fritillaries and, if we're lucky, Florida Purplewings and Hammock Skippers. Three-spotted Skippers and Salt Marsh Skippers are also possible. After dinner, we may stop to look for Burrowing Owls and Antillean Nighthawks. Night in a comfortable hotel in Marathon. Day 5. Tuesday. We will start the day with a visit to Bahia Honda State Park, that was home to one of the last remaining colony of Miami Blues in the United States. Although now apparently extirpated, our hope springs eternal. As a consolation, we may see Martial Scrub-Hairstreaks on the Bay Cedars. From Bahia Honda, it is a short drive to Big Pine Key. Located in the Lower Keys, Big Pine Key holds by far the most diverse and abundant butterfly fauna of any of the Keys, and we will spend the rest of the day savoring its butterfly flavors. A beachfront area of the island contains a small tropical hardwood hammock in which we may see Hammock Skippers, perching under leaves, and Mangrove Skippers – large and powerful skippers with brilliant iridescent blue wings. Mangrove Buckeyes and Eastern Pygmy-Blues should be flying over the mangrove flats. Elsewhere on the island, in pine rockland habitat, we may see Bartram’s Scrub-Hairstreaks and the endemic Florida Duskywing, with its violaceous sheen. One of the jewels of the Keys, Amethyst Hairstreaks are rarely seen butterflies that are most easily seen during their courtship activities around 7 pm. We plan on visiting a special spot that gives us a legitimate shot at seeing these elusive butterflies. Night in Marathon. Day 6. Wednesday. A drive to the almost mythic Key West takes us through what was some of the best (and only) habitat for Zestos Skippers. It has been seen here in May, although we will be extremely fortunate to see this exceedingly rare species that hasn't been seen in the U.S. for years. Our chances of finding perky Tropical Checkered-Skippers, Barred Yellows and Mallow Scrub-Hairstreaks and Fulvous Hairstreaks are much better. Visiting a number of parks on Key West itself we may see Little Yellows, Phaon Crescents, Zarucco Duskywings and Eufala Skippers. Night in Florida City. Day 7. Thursday. Fakahatchee Strand State Park (70,000 acres) is one of the wildest places in Florida. Depending upon the vagaries of the flight season, Palamedes Swallowtail, Little Metalmarks, Georgia Satyrs, Queens, Soldiers and Monk Skippers may be common in this relatively unvisited natural area. Ocola and Brazilian Skippers are possibilities. On a recent visit we observed a mink strolling along a roadside here. Be prepared for many alligators! Night in Florida City. Day 8. Friday. Today we will visit the southern-Miami/Homestead area. The Deering Estate, a Miami-Dade County Park that has only recently been open to the public, contains the largest tropical hardwood hammock (150 acres) extant on the Florida mainland. The Deering Estate is home to many exciting tropical species. A trio of very large, yellow-to-orange butterflies, Cloudless Sulphurs, Large Orange Sulphurs and Orange-barred Sulphurs, should all be bouncing high in the air along the hammock trails. Giant Swallowtails may be common. We have excellent chances of finding Florida Whites, Dina Yellows and Ruddy Daggerwings and a good chance of viewing Dingy Purplewings. If time allows, we may also visit Castellow Hammock Nature Center in Homestead. This compact tropical hammock provides another opportunity for purplewings and Barred Yellows, Dainty Sulphurs, Zebra Heliconians, Julia Heliconians, Cassius Blues and both Dorantes Longtails and Long-tailed Skippers may be common. Malachites, the huge flying-emeralds of the butterfly world, are a possibility. Night in Florida City. Day 9. Saturday. The trip ends at 9 AM at the Miami airport. Leader will be Alana Edwards, president of the NABA-Atala chapter. Cost of the trip is $2695/person from Miami. Cost includes double-based accommodations, lunches and soft drinks, ground transportation, airport transfers, tour leader fees and entrance fees. Not included are dinners, alcoholic beverages, laundry services, and other items of a personal nature. Single supplement is $350. This trip is limited to 8 participants. Malachites may be the easiest butterflies in the United States to identify!